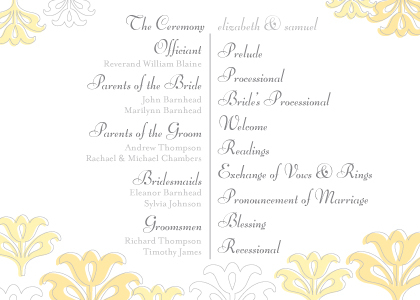 Wedding programs are popular for both function and form at a wedding. Programs for weddings honor and recognize the special people in your wedding party, as well as those participating in your ceremony in other ways. Your wedding program can explain important rituals that may not be familiar to guests, and provides an order to the events, from songs to readings to instructions for the receiving line. Finally, a wedding program makes a beautiful keepsake. LookLoveSend recognizes the importance of wedding programs to a well-executed ceremony. We know how personal a wedding program is to each couple, so we make sure you can personalize your program the way you want. 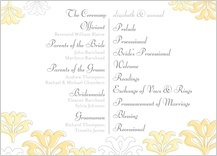 You can even coordinate your wedding program design with your unique wedding invitation design. Include a personal note, song lyrics, a stanza of poetry, or a Scripture verse. LookLoveSend provides you with everything you need to create your perfect wedding program. As one of the premier wedding invitation websites, we make it as easy as a few mouse clicks to choose a program design, enter text, select font styles and colors. You'll also receive a sample of your wedding program to review and approve. If you are not satisfied, we will work with you until your wedding program is ready for printing. Our award-winning customer service department is dedicated to your 100 percent satisfaction. We never send anything out to a third-party printing source. This assures you a fast turnaround time and exceptional quality. Since we handle everything on site--in-house design, customer service, printing and shipping--we guarantee your wedding stationery will be perfect. Our designers constantly add fresh, new designs in a variety of styles. Whether your prefer two-page, fold-out wedding programs or a simple flat card, you will impress your guests with a single design to coordinate your wedding invitations, wedding response cards, wedding reception cards, wedding direction cards and wedding programs.